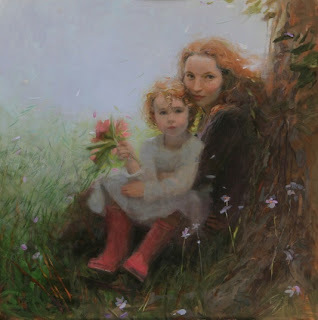 Stanka Kordic is an American painter, born of Croatian parents. She graduated from the Cleavland Institute of Art in 1985 and has traveled in Europe for inspiration. Kordic worked as an illustrator for many years doing editorial art, package design, and book illustration. In 1988 she started a fine art studio so she could work on her own paintings of landscape and figures. She has been recognized locally (in Ohio) in various shows as well as being a part of corporate collections such as: the Cleveland Clinic, University Hospitals, and Key Bank. She says that her cultural tradition gave her work ethic and a passion for life that helped her do freelance work. Kordic's client list spans the US, crossing the ocean to England and Croatia and she has been shown in exhibitions in various US states. Her website is here. Kordic's work is about the separation between the natural world and humans. She integrates her portraits into the landscape to bridge this gap and says that her paintings allow for contemplation in our hectic lifestyles. The connections between things like the light and color and the figure and landscape or her to her painting are important to her. 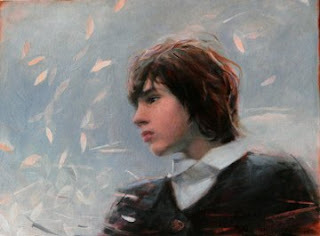 Stanka Kordic likes to slowly build up the paint on her work in order to intuitively understand the figure and paint. I love the emotive feel that Kordic's paintings give. I also am entranced by the movement of the brushstrokes that she uses in her painting. The paintings by Stanka Kordic can be seen here.